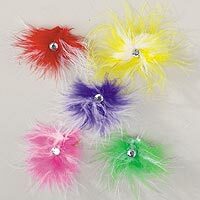 Feather Bows in five fun colors feature a rhinestone for added glitz. You will love this alternative to traditional bows and return for the same unique detailing. Each bow features an elastic band for quick and easy attachment. 2 for $1.00. You choose color of first bow, we pick the other.